Corban Estate Arts Centre’s latest exhibitions – Floating a solo sculptural exhibition by Regan Gentry in conjunction with New Grads Show an annual showcase of up and coming visual arts graduates are on display from 26 January to 24 February 2013. Regan Gentry’s exhibition, Floating features a witty selection of objects skillfully carved out of pumice that plays on physical qualities distinctive to this volcanic rock. The exhibition includes sculptural renderings of an inflated lilo and tyre titled Floating Land (2011) and Lite Lunch (2009) a chilly bin complete with a thermos set, they refer to pumice’s ability to be buoyant as well as insulate both cold and heat. As an artist Gentry explores the relationship between people and their environments through the use of specific materials. In a previous exhibition Gentry fashioned objects exclusively out of gorse wood to draw attention to New Zealand’s colonial past when flora like gorse was introduced to the country only to become a pest. In Floating, pumice is treated as a metaphor for contemporary life, as both can be formed out of intense pressure or just left suspended to float adrift. On Saturday 2 February, 11am artist Regan Gentry will present a public exhibition talk and a pumice carving demonstration, sharing his extensive knowledge and experience of this iconic volcanic material. Gentry has exhibited extensively and completed major public sculpture commissions nationally and in 2012 he was the 18th McCahon House Artist in Residence. He currently works from an artist studio in Oratia, West Auckland. Simultaneously on display is a chance to see the most current approaches in contemporary art that is emerging from art schools to date, in the annual New Grads Show featuring 10 new visual arts graduates selected from the Auckland region. Artists include: Louisa Afoa, Karina Balea-Raitz, Kristina Berends Fu-On Chung, Rosalind Horner, Anna Maxwell, Kenneth Merrick, Alexa Mickell, Clinton Richards and Kerrie-Anne Van Heerden. Image credit: [left] Regan Gentry, Lite Lunch (2009), Courtesy of The James Wallace Arts Trust. [right] Karina Balea-Raitz (2012) No.9. 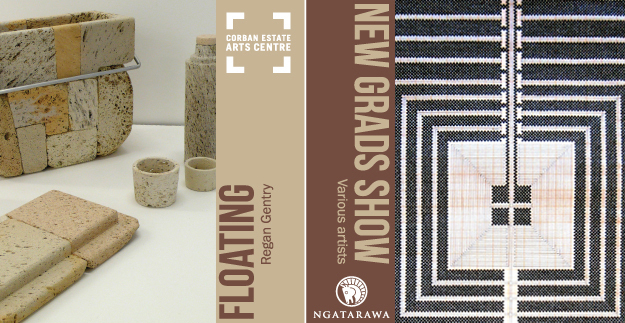 To find out more about these exhibitions and Corban Estate Arts Centre’s ongoing activities, programmes and events visit: www.ceac.org.nz or contact us at: info@ceac.org.nz or by phone at (09)838 4455. Corban Estate Arts Centre is open seven days a week, from 10am to 4.30pm except for public holidays and over the Christmas/New Year period.